patch andi: The Beehive is back!! Round 2 of the Beehive has kicked off with a bang. 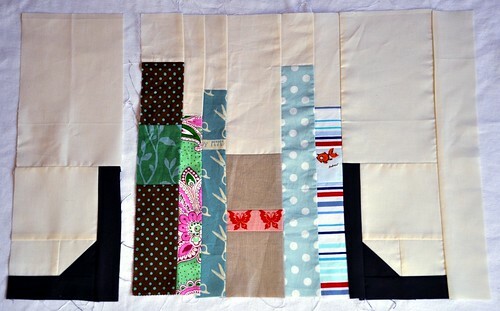 Meg (a mad quilting librarian) has requested book shelf blocks using our own scraps. You should have a look at some of the amazing blocks offered by our other Beehivers. An homage to books arranged by spine colour. I've added bookends to this one but I left one of the bookends unattached so Meg can place it where she likes on the 'shelf'. I've posted them off today Meg. I hope you like them. 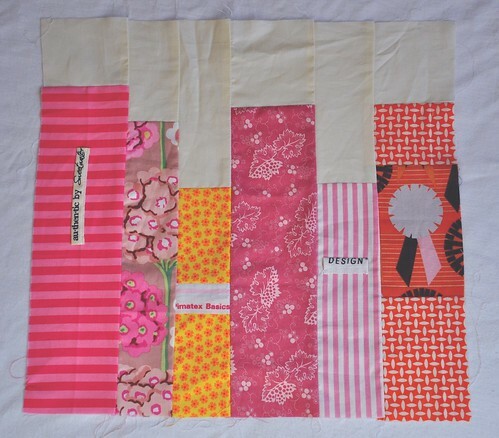 Can't wait to see how this quilt comes together. It's going to be a ripper!!! oh these blocks are all such fun! If you ever have an opening in your Bee I would love to be considered! Andi, I can't tell you how much I'm looking forward to seeing these pretties in person! So cool, I love all the little additions! And those bookends, as I've said, are clever beyond belief. Thank you!